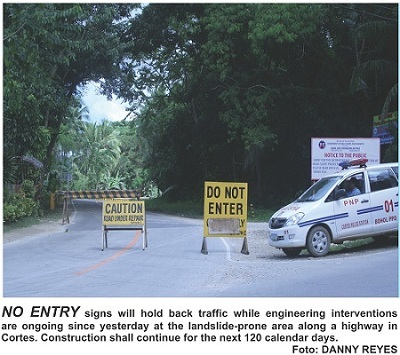 The national highway along the landslide section in sitio Liloan of Poblacion, Cortes has been closed starting yesterday while the Department of Public Works and Highway undertakes the over P12-million long-term engineering interventions in the area for 120-150 days. Engr. Ester Calacat of the DPWH yesterday said the contractor already started with the excavation on the slope. Governor Edgar Chatto and Provincial Administrator Alfonso Damalerio II had been pushing for the engineering interventions as long-term solution to the series of landslides in the area, at least three times during the rainy days in the first three months of 2011. Upon the request of the local government unit of Cortes, the engineering works commenced yesterday right after the town fiesta celebration last Sunday. Calacat said CCM Construction—the project contractor—started bulldozing the top portion to convert the cliff into a slope of safe angle. “It would take time. After bulldozing the area to convert the cliff into a slope, we will widen the roadside and construct a seven-meter-high rip-rap. Then we will put coco net at the upper portion and we will plant bertiver plants to hold the soil in place,” Calacat explained. She said the bertiver plant resembles a lemon grass but with more penetrating roots, thus, recommended to hold the soil and prevent landslide in the slope. Calacat estimated the entire project would take 120 calendar days, but Engr. Duran of CCM Construction explained that it would take them 150 days to finish the project. Calacat also said the traffic has to be re-routed to the SIP road to keep motorists and travelling public safe in case of falling objects while bulldozing is ongoing. CCM Construction already set up warning signs, no-entry signs and barricade with reflectors for them to be visible at night. The contractor already coordinated with the LGU for the deployment of policemen to man the traffic. While work is going on, CCM Construction will continue to assess the situation at the detour in the first few days so that they can add more reflectors, warning signs, and lightings in the area if needed. They had also tapped the radio stations to announce ongoing works in the area so that the motorists and travelling public will be guided accordingly. Po2 Victor Mahumot of Cortes Police Station confirmed that cops have already been deployed to take turns in manning the area with two cops in every shift—one in every point of the SIP road. Po2 Jerome Crisologo and PO1 Hino Namoc were the first cops deployed to man the area yesterday. Crisologo assured the public that they would immediately inform the town mayor in case they would need additional streetlights or if some of them need replacement so that the area will be well-lighted at all times, especially at night.